The photo archives hold many images of colorful foods that lend themselves well to this week’s COLOR theme on WordPress. Here are some of my favorite-but-unique foods that find their way into Zeebra Cuisine. What’s Cooking? Hibiscus buds and chopped hibiscus petals rolled into gumbo! Starfruit and Hibiscus make a beautiful, fragrant and delicious tea. Ah,! Fresh always trumps dried flowers! 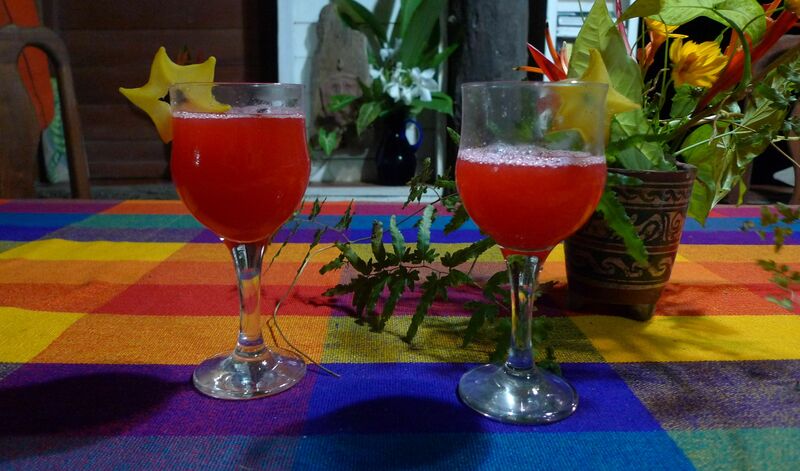 More information about cooking with hibiscus can be found HERE. I hope you’ve enjoyed these slices of colorful food from Zeebra’s kitchen! i prefer a salad of hibiscus flowers over regular (boring) lettuce! the flowers take on the flavor of whatever dressing is used, but they still have a unique silky and delicate texture, a bit like buttercrunch lettuce. they’re packed with vitamin a, iron, antioxidents and are associated with lowering blood pressure! they’re really good for women’s health! enjoy using them in your future meals! 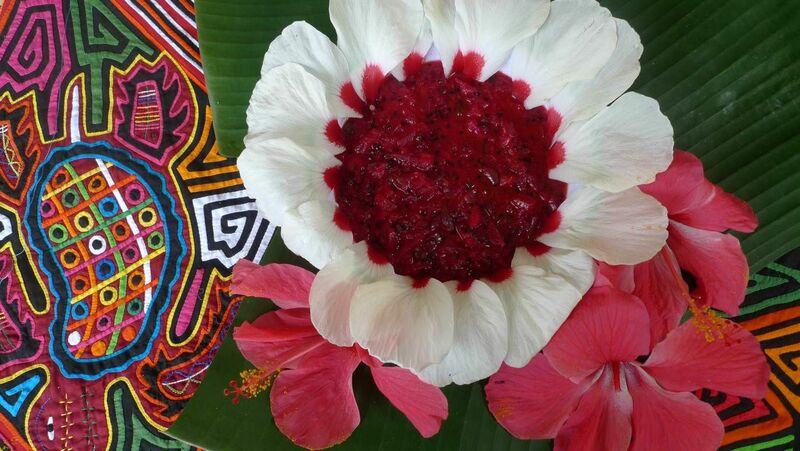 ‘gumamela!’ that’s a new one, i’ve heard them called ‘flor de jamaica’ and sometimes flor de china… thanks amiga! Thanks for this joyful fireworks of colors and savors ! Hope that we will meet again, together with Lise, Marie, Hank…. You feed my soul with colour!!! Thank you…. You have such beautiful and important things to share Ms. Lisa. Please enjoy a wonderful week ahead. do you know the fruit called ‘tuna’ which comes from a cactus? (so does pitaya) it’s a lot like that.. i’d compare it/them to a kiwi fruit. Great post! 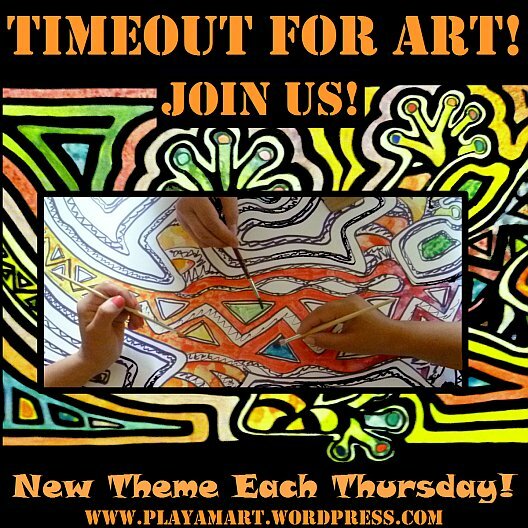 Fruit and colours together with your vibrant art – just excellent! thank you! i suspect that you enjoy a pretty table as well! Great eye appeal to such a delicious looking plate of food & colors. What time is dinner? the quinoa has been cooked; the tomato sauce is finished. 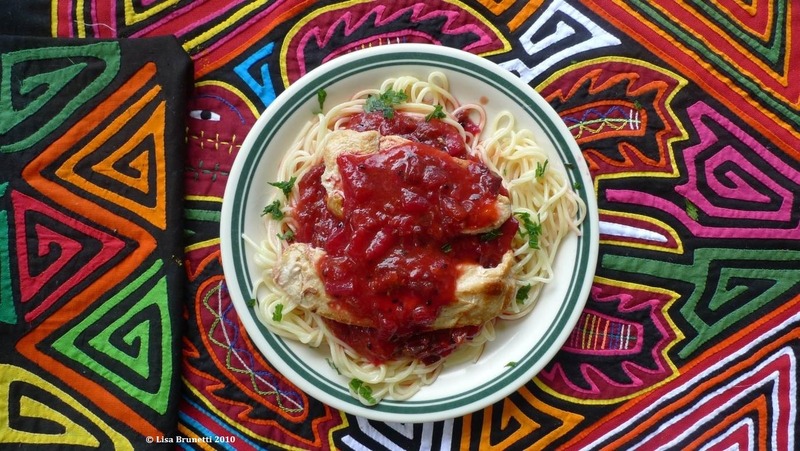 all we have to do is pull a few more things together for another colorful and nutritious dinner! thanks! Yet another knock-out post! 🙂 Love the colorful food! The colors are magnificent. The food looks incredible. The post is eye-popping! Great stuff, z.
thanks! i think you’ll like the photos of today’s progress on the magic carpet! coming soon! 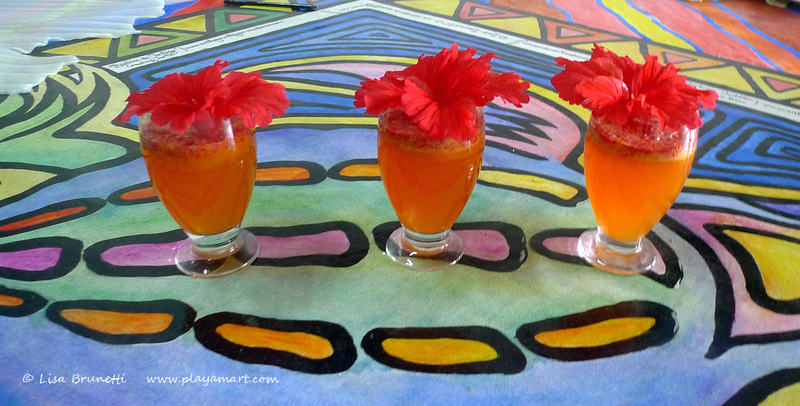 Colorful, Healthy and Delicious… Beautiful post, z! thank you! 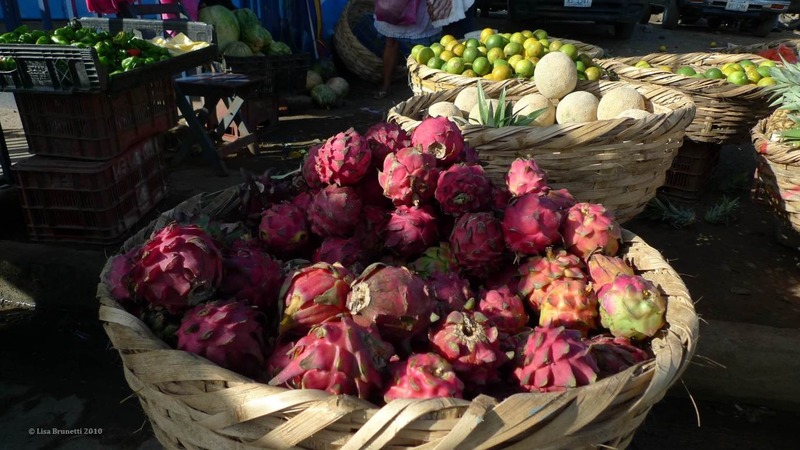 peel and eat the dragon fruit for a lovely healthy fresh fruit fix! or put on a creative license hat and use it like you would tomatoes! that’s about the easiest way i can tell how i cook! it lends itself well to cooking, but the bright fushia color sometimes is a bit ‘much’ alone, so i tone it down with tomato paste for a more ‘normal’ sauce to go over pasta! i thought about that after i replied to your comment; yes, the seeds are fine – just ignore them and consider them as more fiber! HAHA! Okay. I’ll try to eat them again. My only access to them is through the grocery. The seeds may be bitter in them. I’ll let you know! Thanks. they were straight-from-the cactus when i stayed in nicaragua one ‘october/november’ a few years ago. i had never seen them before and really loved eperimenting with them. perdon, my computer is not letting me type the key that goes between w and y! 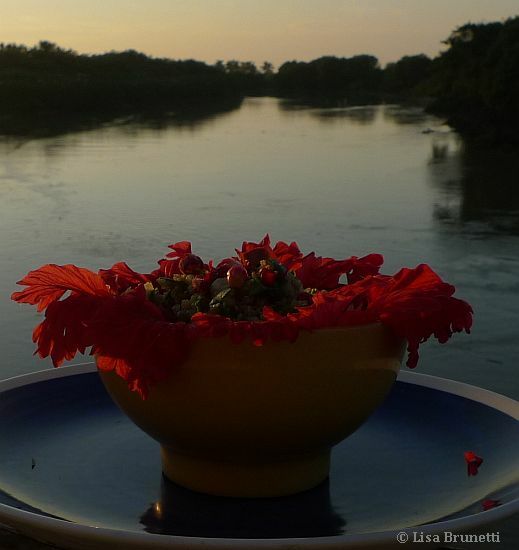 Your blog delights the senses in so many ways! Wonderful post! The floors make the food and the food makes the floors. Can’t beat that! thanks, tina! we’ve had a fun time painting the floor, and it’s nice to reap the benefits of hard work and sit down and enjoy the magic carpet! One word about your colorful portfolio: VIBRANT! Love all these brilliant colors.. Foods really can be quite pretty!! yes they can (be quite pretty!) – they’re not only pretty here, but are a good value for the money as well! Your post has made me very hungry. I love vibrant color. You’ve showcased many that I think are fabulous. I have seen Pitalla ( Dragonfruit) but didn’t have a clue on how to eat it. thank you amiga! 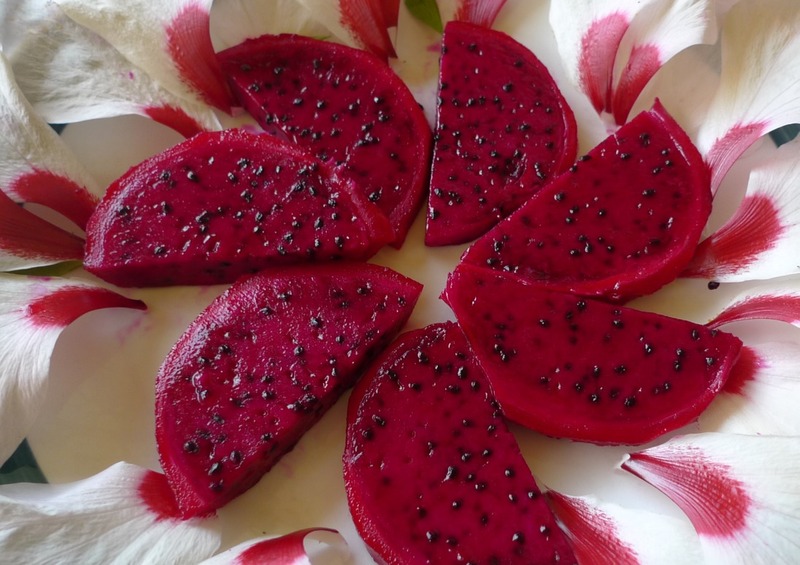 yes, dragonfruit is so delicious and is a very good food for your health. buy one and peel it, slice it, dice it and enjoy it just like it is.. or whirl it into a drink… or make a sauce or salad.. there are endless ways to use, it but most people just eat it as a fruit or make a drink from it. Delicious food and hot colours love your posts. thanks, jack! yes, that was a very colorful post! All your paintings are colourful and the food made my mouth watter. thanks! with all of the color at the local markets, it’s easy to find something worthy to eat – or to photograph!